September 3 — Saint Gregory the Great, Pope and Doctor - Memorial - My Catholic Life! When your salad is awesome, your parking space is amazing, and your internet connection is great, there’s a problem. Overused superlatives diminish their own meaning and crowd the linguistic space reserved for things which are truly awesome, amazing, and great. Today’s saint sent the large missionary party that trekked across Europe and converted Saxon England to Catholicism, establishing a culture that endured for almost a millennium. That’s awesome! He wrote a theological work that was used for centuries by thousands of bishops to help them become more fatherly pastors. That’s amazing! Gregorian chant is named after him; he is one of the four Latin Fathers of the Church; he was the first pope to use Servant of the Servants of God as a papal title; he alone preserved the memory of Saint Benedict with a biography; he made revisions to the content and structure of the Mass, which are part of the liturgy until today; and he was the most impactful pope of the long span of centuries from the 500s to the 1000s. These accomplishments truly merit the title Great with which Saint Gregory has been justly crowned by history. Pope Saint Gregory the Great was born into a noble Roman family with a history of service to Church and empire. The family home was perched on one of Rome’s seven ancient hills, the Caelian, which Via San Gregorio still cuts through today. His father was a Roman senator, although at a time when Italy was in decline and the imperial government was based in Constantinople. Gregory received an education in keeping with his class, and became the prefect of Rome, its highest civil position, in his early thirties. In 579 he was chosen by the Pope as his emissary to the emperor’s court in Constantinople, primarily to seek the emperor’s assistance in protecting Rome, and Italy, from the Lombard tribes that had long ago overrun her. He was elected the Bishop of his home city in 590 and was thus obligated to abandon the quiet life of a monk, which he had been living with some friends for a few years in a small monastery near his family home. 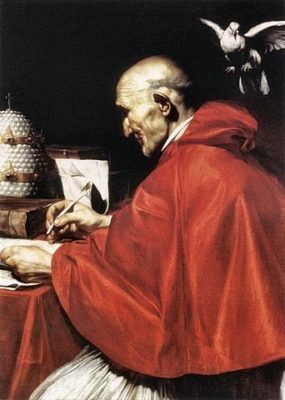 In numerous letters which have fortunately been preserved, Pope Gregory, soon after his election, bemoans the loss of his monastic solitude, peaceful recollection, and life of prayer. But he had only been a monk for a few short years. Gregory’s skills as an administrator, honed in his long years of prior civil and church leadership, proved valuable when he sat on the chair of Saint Peter. He drew into the orbit of papal authority the bishops of France and Spain who had, until then, been operating somewhat autonomously. He secured the allegiance of the northern tribes living in Italy to orthodox Catholicism, not the Arian counterfeit version they had held for centuries. And he made the fateful decision to personally organize and promote the great, and highly successful, missionary journey of Saint Augustine of Canterbury to the kingdom of Kent in England. Pope Saint Gregory the Great’s legacy in liturgy, pastoral doctrine, and miracles left a deep mark on medieval Europe and beyond. The Council of Trent in 1562 mandated the suppression of votive Mass cycles for the dead or for any other need. But the Council Fathers made one exception: Masses of Saint Gregory, a cycle of thirty Masses on thirty consecutive days for the release of a soul from purgatory, were not suppressed. Almost a thousand years after his death, Gregory’s memory was too venerable to suppress. He was an encourager of the encouragers, a bishop who modeled, strengthened, and explained how and why his fellow bishops should be fathers first and lords second. Pope Saint Gregory the Great, your example of holy leadership, of scholarly practicality, of balance between universal and local concerns, helps all Christians to weigh their many duties in a proper balance and to choose correctly what matters most to God and their own salvation. GREGORY was a Roman of noble birth, and while still young was governor of Rome. On his father’s death he gave his great wealth to the poor, turned his house on the Cœlian Hill into a monastery, which now bears his name, and for some years lived as a perfect monk. The Pope drew him from his seclusion to make him one of the seven deacons of Rome; and he did great service to the Church for many years as what we now call Nuncio to the Imperial court at Constantinople. While still a monk the saint was struck with some boys who were exposed for sale in Rome, and heard with sorrow that they were pagans. “And of what race are they?” he asked. “They are Angles.” “Worthy indeed to be Angels of God,” said he. “And of what province?” “Of Deira,” was the reply. “Truly must we rescue them from the wrath of God. And what is the name of their king?” “He is called Ella.” “It is well,” said Gregory; “Alleluia must be sung in their land to God.” He at once got leave from the Pope, and had set out to convert the English when the murmurs of the people led the Pope to recall him. Still the Angles were not forgotten, and one of the Saint’s first cares as Pope was to send from his own monastery St. Augustine and other monks to England. On the death of Pope Pelagius II., Gregory was compelled to take the government of the Church, and for fourteen years his pontificate was a perfect model of ecclesiastical rule. He healed schisms; revived discipline; saved Italy by converting the wild Arian Lombards who were laying it waste; aided in the conversion of the Spanish and French Goths, who were also Arians; and kindled anew in Britain the light of the Faith, which the English had put out in blood. He set in order the Church’s prayers and chant, guided and consoled her pastors with innumerable letters, and preached incessantly, most effectually by his own example. He died A. D. 604, worn out by austerities and toils; and the Church reckons him one of her four great doctors, and reveres him as St. Gregory the Great. Reflection.—The champions of faith prove the truth of their teaching no less by the holiness of their lives than by the force of their arguments. Never forget that to convert others you must first see to your own soul.